A recent report published by Infinium Global Research on domestic booster pump market provides in-depth analysis of segments and sub-segments in the global as well as regional domestic booster pump market. The study also highlights the impact of drivers, restraints and macro indicators on the global and regional domestic booster pump market over the short term as well as long term. The report is a comprehensive presentation of trends, forecast and dollar values of the global domestic booster pump market. According to report the global domestic booster pump market is projected to grow at a CAGR of 8.60% over the forecast period of 2018-2024. A booster pump is a machine that increases the pressure of a fluid. These domestics’ booster pumps are used to provide sufficient water pressure in case of absence of sufficient pressure. Domestic booster pumps are used in residential flats, farmhouses, houses, and guesthouses. Booster pumps are one of the important forms for providing water. There are many types of booster pumps. On the cost profile of a normal pump life-cycle, the energy cost is nearly 40% of the total united with maintenance & repair and can rise more than 80%. As per the U.S. Department of Energy, potential energy saved using intelligent pump system can be almost 20% of the total energy required of the process. Due to the growing population pressure, the pressure of water changes during peak hours as demand rises. Besides, poor water management from municipal corporations and growing water consumption through single water source drive the growth of the booster pump market. Further, owing to continued growth in population and residential construction the consumption of booster pump is increasing that is eventually helping the market to grow. In addition, technological advancement in product manufacturing to produce a different product portfolio acts as the power to the domestic booster pumps market. 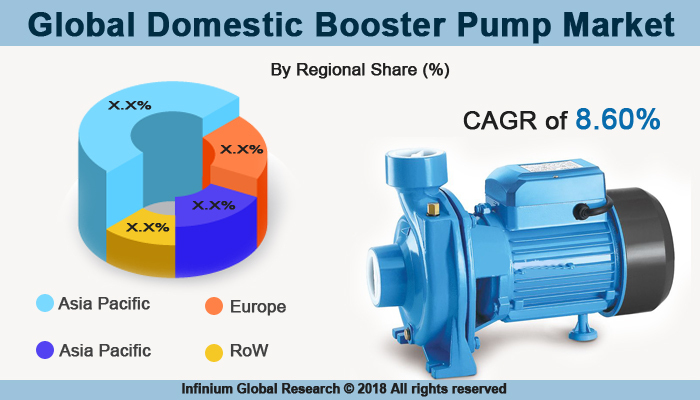 In terms of geographies, the Asia Pacific region is estimated to have the highest growth rate in Domestic Booster Pump market followed by Europe. In the Asia Pacific regions, factors such as continued growth in population and growing residential construction in this region are driving the growth of this market. Furthermore, immigration of rural citizens into urban centers with the constant development of rural areas is also likely to create high demand for booster pumps in water infrastructure, and power generation to meet the basic needs of the increasing population. The report on global domestic booster pump market covers segments such as product, application and distribution channel. On the basis of product, the global domestic booster pump market is categorized into multiple stage and single stage. On the basis of application, the global domestic booster pump market is categorized into farmhouses/cottages/guest house and residential homes/flats. On the basis of the distribution channel, the global domestic booster pump market is categorized into wholesalers and third party installer. The report provides profiles of the companies in the global domestic booster pump market such as Aquatec International, Inc., KSB Pumps Limited, Grundfos, Kärcher International, Wilo SE, Dab Pumps Spa, Franklin Electric Co., Inc., Xylem Inc., SyncroFlo Inc., and Zodiac Pool Solutions. The report provides deep insights into demand forecasts, market trends, and micro and macro indicators. In addition, this report provides insights into the factors that are driving and restraining the global domestic booster pump market. Moreover, IGR-Growth Matrix analysis given in the report brings an insight into the investment areas that existing or new market players can consider. The report provides insights into the market using analytical tools such as Porter's five forces analysis and DRO analysis of domestic booster pump market. Moreover, the study highlights current market trends and provides forecast from 2018-2024. We also have highlighted future trends in the domestic booster pump market that will impact the demand during the forecast period. Moreover, the competitive analysis given in each regional market brings an insight into the market share of the leading players. This report will help manufacturers, suppliers, and distributors of the domestic booster pump market to understand the present and future trends in this market and formulate their strategies accordingly.